Join thinwall tube to solid base. Join thinwall tube to machined base. Join solid caps to both ends of tube for hollow center. Join heavy wall tube to solid end to avoid extensive drilling. Image shows the progression from 1) raw material, to 2) blank weldment, to 3) finish machined to print. Friction Welded tube wall section through the joint. Strength and performance are equal to solid material. Join dissimilar metals as in this case with nickel ends to DOM tube. Cross cut section of well drilling rod. 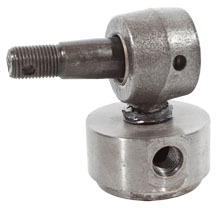 Threaded end is friction welded to drill pipe body. 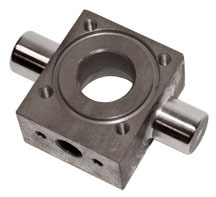 Use a near-net-blank to save machining time and material. 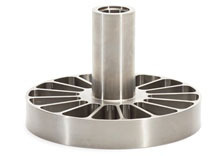 This pump impeller is machined from the blank above. 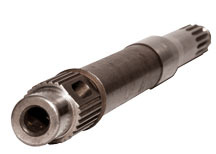 Drive gears are made from Friction Welded blanks to save on forging cost and to shorten lead times. 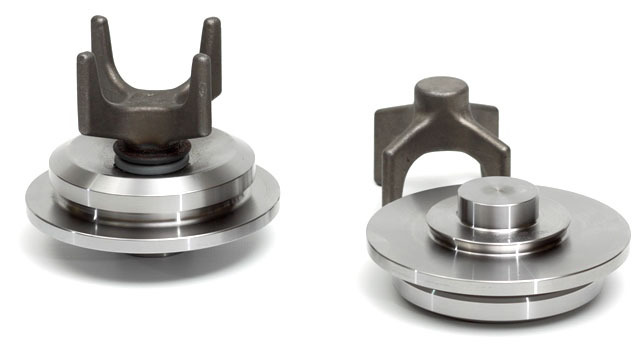 In this example, valve pistons are machined from a near-net blank. This near-net blank “tee-fitting” is ready for finish machining. Three piece blanks made of dissimilar metals ready for finish machining. Blank bi-metal oilfield sucker rod ready to be machined. Join with orientation to opposite end features as seen in the port alignment on this ball joint. 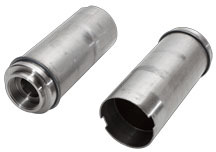 Cold-formed shafts are Friction Welded to Powder Metal ends. 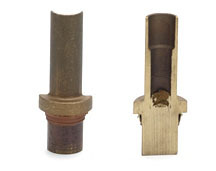 These cutting tools are shown before and after weld-flash removal. 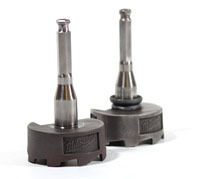 Forged valves are Friction Welded to cast guide legs. Prop shaft Friction Welded to CV Joint. Offset opposing shafts joined to a common plate. Threaded cold formed solid ends joined to honed tubes. A double ended hydraulic piston rod is bonded with the advantage of a full strength, penetration fusion of material. This special casting is bonded to a carbon steel shaft. Pivot shafts are bonded with friction welding two sides of this hydraulic cylinder base. 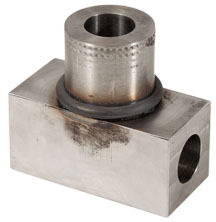 This creates a trunnion block to allow swiveling hydraulic cylinders. Bi-Metal Friction Welding of copper to aluminum busbar (bus bar) for electrical components industry. 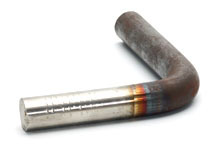 Bend test verifies weld strength. Brass tube Friction Welded to a solid base. Friction Weld stainless to carbon steel with outstanding joint strength. Copper to silver Friction Welded to make an electric diode. Aluminum bar stock destructive bend test showing the strength of friction welded bond. 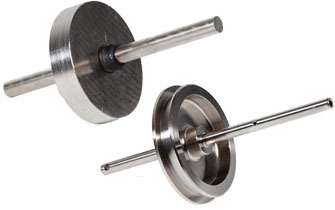 Marine Prop Shafts are an excellent bi-metal application. The “wet-end” is made from 17-4 stainless steel. 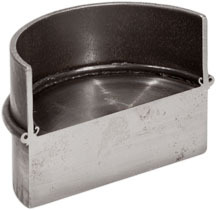 The drive-end is sealed in the power transmission unit and is made from hardened 8620 carbon steel. 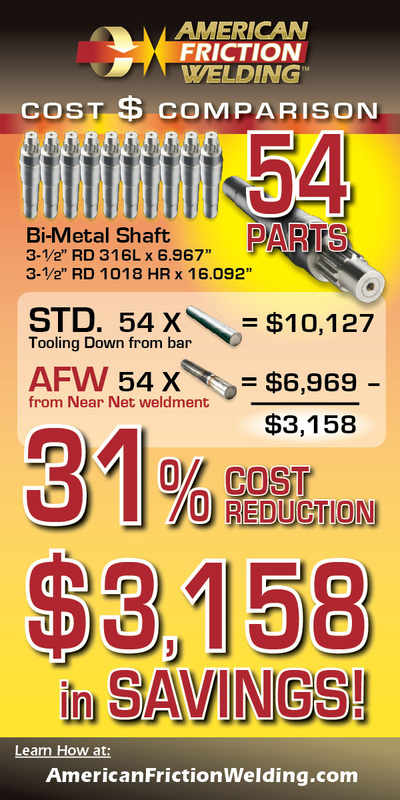 Learn about the economics and performance results of extending cobalt tool tips with mild steel extension shafts. Durability requirements in the chemical manufacture and handling industry dictate the use of expensive alloys to withstand harsh environments. Learn how performance and economics are improved by friction welding an alloy “wet end” to a carbon steel main shaft. 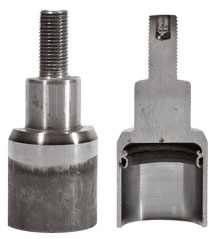 This case study illustrates how friction welding, or bonding as it is sometimes called, is used to join uniquely shaped ends to hardened chrome rod with all the strength of solid material.